The 79 mile Great Glen Way follows a route across Scotland from Fort William to Inverness. The Great Glen is Scotland’s longest glen and was formed by the Great Glen fault, which divides the Northwest Highlands from the Grampian Mountains. From Fort William to Inverness the Great Glen Way takes you through beautiful landscapes and past historic buildings. The trail follows the segments of the brilliantly engineered Caledonian Canal, which link the sea loch at Fort William to Loch Lochy, Loch Oich, the mysterious Loch Ness, and sea water once again at the Moray Firth, where Inverness Castle marks the end of the Great Glen Way. When it was opened in 2002 the Great Glen Way became Scotland’s fourth long distance path. The trail is mainly lowland walking following tow paths alongside the Caledonian Canal and woodland tracks along the banks of the lochs, though there are some challenging sections. The Great Glen Way is an excellent extension to a weeks walking on the West Highland Way. Each night on the trail you stay in a different location in prebooked selected accommodation, with breakfast provided. Your luggage is collected daily and moved to your next accommodation. You can start your Great Glen Way self-guided holiday on any date of your choice between April and October. Generally this is generally an easy to moderate route with some strenuous walking in the final section of the route. The terrain varies from tow paths, good woodland footpaths and rolling hills. Evening meals, packed lunches, drinks and snacks, travel insurance, travel to Fort William and from Inverness, souvenirs, laundry services, etc. Accommodation is provided in carefully selected walker friendly B&Bs, Guest Houses, small Hotels and Inns. We aim to book rooms with ensuite or private facilities every night, however in one village ensuite accommodation is limited and we may have to book a room with shared facilities for one night of your holiday. The 79 mile Great Glen Way follows a route across Scotland from Fort William to Inverness. The Great Glen is Scotland’s longest glen and was formed by the Great Glen fault, which divides the Northwest Highlands from the Grampian Mountains. From Fort William to Inverness the Great Glen Way takes you through beautiful landscapes and past historic buildings. The following is intended to provide further information about the route. Please note that all distances and heights in this document are approximate and along with all the other information are provided as an aid to describe the route. Fort William (height above sea level 10m) to Gairlochy (30m). The Great Glen Way starts at Fort William, a town on the shore of Loch Linnhe. The route out of Fort William takes you past the ruins of the 13th century Inverlochy Castle and onto the embankment of the Caledonian Canal. You follow the canal to the spectacular Neptune's Staircase, a tightly packed series of eight locks that raise the canal 64ft/20m. There are wonderful views of Ben Nevis. The route continues on a good path alongside the canal to Gairlochy. Gairlochy (30m) to Laggan (30m). The Caledonian Canal meets Loch Lochy and you follow clear paths and forest tracks close to the shore of Loch Lochy. The Loch is said to be inhabited by a monster known as ‘Lizzie’. This is Clan Cameron territory and it is possible to take a detour to the Clan Cameron museum at Achnacarry. The route follows the Loch for approximately 10 miles to the next section of the Caledonian Canal at Laggan Locks. Laggan (30m) to Fort Augustus (20m). The route follows a short section of canal which links Loch Lochy to Loch Oich. The 4 mile route alongside the Loch follows the course of an old railway line and stretches of General Wade’s military road. You arrive at the next section of the Caledonian Canal and the Great Glen Way follows the canal side path to the locks at Fort Augustus. Fort Augustus lies at the southern end of Loch Ness, home of the legendary Loch Ness Monster, ‘Nessie’. Fort Augustus (20m) to Invermoriston (30m). This relatively easy section can be combined with the stretch from Laggan to Fort Augustus to create a ‘full day’s walk’. The route leads through Fort Augustus and a short climb brings you to a forest track. You follow paths and forest tracks above the shore of Loch Ness to Invermoriston. There is also an alternative high level route which climbs above the forest and offers more expansive views. Invermoriston (30m) to Drumnadrochit (30m). The Great Glen Way continues to follow mainly forest tracks alongside Loch Ness from Invermoriston to Drumnadrochit. For the last section the route drifts away from Loch Ness and picks up the path of a minor road. As you approach Drumnadrochit you can detour to visit the ruins of Urquhart Castle, on the shore of Loch Ness. The 13th century castle was once one of the largest castles in Scotland. There is also a high level optional route from Invermoriston to Drumnadrochit. Drumnadrochit (30m) to Inverness (10m). This is the longest and hardest section along the Great Glen Way. You have the option to complete this section in one day or split this section into two days. There is no accommodation along the route so return transfers from/to Blackfold and Drumnadrochit are included in the 8 night’s accommodation/7 days walking itinerary. You leave Drumnadrochit along the road and join the tracks through the forest. The tracks leave Loch Ness and climb to the highest point on route, 380M, in Abriachan Forest. You follow the course of an old drove road passing Blackfold. The route descends back into the Glen on the outskirts of Inverness. 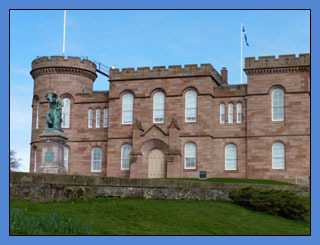 You cross the Caledonian Canal and then follow a path alongside the Rover Ness to finish at Inverness Castle. Your starting point in the UK will probably determine the best transport option for you. Although there is a train station in Fort William it is sometimes quicker and more cost effective to take the train to Inverness or fly to Inverness airport, and then bus to Fort William. There is a train station in Inverness. Dear Dean, I just wanted to let you know we had a wonderful holiday in Scotland. All the accommodation that you booked for us was great. Everyone looked after us so well...Thank you for looking after us so well again. You run a tight ship, and it is much appreciated. 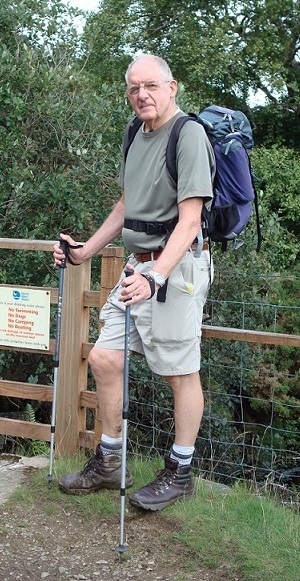 Hi Dean, All went well on my second long distance walk. All the accommodation hosts were very friendly and the rooms were lovely. The weather could have been better but I was prepared ... and it is the Highlands after all. Directions to all the B&Bs were excellent ... at the end of a long day, the last thing I wanted was to have difficulty finding my bed!! Thanks for the opportunity to use your services. Hi, Thanks for organising a wonderful trip. We hope that you will appreciate some feedback. Overall, the B&B’s met, or exceeded, expectations. Thanks again for what, overall, was a most enjoyable trip. We greatly enjoyed our walk up the Great Glen. Thank you for organising it so efficiently. Everything went smoothly, including the weather which was fantastic - no rain and no midges! All the B&Bs were very welcoming and comfortable, and some were of an exceptionally high standard. There were unexpected little touches. The highlights were a pine martin feeding outside our bedroom window at Fort William, and a small decanter of sherry and fresh baked shortbread by our bedside at Drumnadrochit. Others were an uninterrupted view of Ben Nevis from the breakfast table at Gairlochy and banana bread straight from the oven on our arrival at Invermoriston. It was a very memorable holiday. Thank you. Many thanks for providing another well organised and enjoyable walking holiday. All the B&B's were very good, and the route well signed so no problems.